Short lemon crops in South America and South Africa has generated good opportunities for Turkish citrus exporters this season. Total lemon exports have been up this year, and prices have been good – though decreasing demand from Europe means more of Turkey’s exports are going to the Middle East and Asia. “Our lemons have enjoyed high demand and good prices all over the global market,” said Ayse Ozler of Ozler. “Demand from the Middle East, Europe and Asia has been quite good, higher than in previous seasons, in fact.” Turkish lemon suppliers typically start exporting their fruit during September, about a month and a half before Spanish lemons edged them out of Europe. While prices at the beginning of that export window typically start at 0.70 Euro, prices this season were around 1.20 Euro at the outset of the season. “Volumes from the Southern Hemisphere were low this year because of a frost in Argentina that cut their volumes by about 40 percent,” explained Ayse. “South African supplies of lemons also ran out early, so the gap in supplies was big, and prices for Turkish lemons were the highest we’ve seen.” Last year’s Turkish lemon crop was also affected by frost, so local demand was already strong when the export window came around, further driving up prices. The early boon resulted in 30 percent more lemon export volume out of Turkey, when compared to the previous season. The situation is now different, with Spanish and Italian supplies driving Turkish citrus out of Europe for the year and bringing down prices. But Ayse explained that the importance of Europe is diminishing for Turkish growers. Competition from Spanish fruit and tightened regulations concerning maximum residue limits has steadily decreased the amount of fruit that Turkish exporters ship to Europe. Russia used to be a big market, but problems there, both recent and long-standing, have made it an unattractive destination for Turkish traders. The major areas of expansion are now the Middle East and Asia. What happens when 1.36 billion people in China migrate toward cities, draw middle-class wages and shift toward “Western” foods such as ice cream, cheese pizza and strawberry-flavored milk? One result: larger profits for U.S. dairy processors, who, like dairy exporters in other countries, are charging record prices for their products at home and abroad, according to Bloomberg News. China’s growing thirst for milk helped push American dairy exports to a record $ 6.7 billion in 2013, according to the U.S. Dairy Export Council (USDEC). January U.S. dairy exports were 35 percent higher than a year earlier, putting the month’s exports ahead of the staggering 30-percent annual growth Bloomberg News reported in 2013. According to the 2014 Tetra Pak Dairy Index, China is just one plane of opportunity. The $ 3.69 price tag on the average gallon of whole milk sold in April 2014 is 7.5 percent more than just a year before, the highest since September 2011. In just three years, when Tetra Pak’s research predicts global dairy demand will overtake production, prices could be even loftier — especially in China, the world’s top dairy importer. This does not mean all is rosy with U.S. dairy exports; sales to China declined 24 percent during August. However, year-to-date (January-August) exports by volume for 2014 are still 21-percent greater than last year, prices remain high, and there are still reasons to retain a positive long view. What’s behind this trend and how can U.S. processors benefit? Milk and cheese are relatively new to the Chinese diet, says Todd Shilk, dairy category manager at Tetra Pak U.S. and Canada, but consumers’ taste for them is growing. A wave of Western culture has swept into the country, bringing with it dairy-based foods. Baskin-Robbins and Pizza Hut have ambitious Chinese expansion plans; drinking milk is increasingly viewed as healthy — especially for kids — and has caught on with an increasingly affluent middle class. Tetra Pak research shows that most liquid milk consumed in China (76 percent) is ultra-high temperature (UHT) treated, which holds advantages over traditional pasteurization. When pasteurized traditionally, dairy products are heated and then packaged. This milk must be continuously refrigerated and still has a brief shelf life (5-15 days). UHT dairy products are briefly heated to high temperatures, then filled into aseptic, shelf-stable cartons, lasting up to a year without refrigeration or preservatives. Traditionally, most milk exports to Asia have been powder; over the past 15 years, however, UHT milk exports have grown steadily and should continue to climb by 3.1 percent CAGR from 2013 to 2016, according to the Dairy Index. UHT milk suits China’s transport infrastructure, which cannot support quick delivery of chilled dairy. And Chinese consumption of UHT milk jumped from 18 million pounds in 2010 to about 331 million pounds in 2013. The USDEC suggests this could quadruple again to 1.3 billion pounds by 2020. UHT milk also empowers use of renewable packaging materials and offers lighter weight and independence from refrigeration. This type of packaging delivers benefits throughout the supply chain. Ross Christieson, USDEC senior vice president of market research and analysis, says that rapid growth in China’s shelf-stable milk market is a gold mine for U.S. dairy exporters. Meanwhile, in the U.S., fluid milk consumption continues a decades-long slide. Bright spots include value-added innovations such as flavored, organic and nutraceutical products. Last year, American milk sales were the lowest since 1984; culprits include fewer people eating breakfast at home (when more than half of fluid milk in the U.S. is consumed). Fewer than 50 percent of adults now drink milk, and whole-milk consumption is half what it was 30 years ago. U.S. dairy producers should still focus on opportunities in their homeland. Dairy innovation could likely abate the slide in consumption here. As novel milk flavors grabbed Chinese consumers and pushed sales up in that country, similar innovations could work magic in the U.S. The Tetra Pak Dairy Index shows that the globe is dotted with areas of opportunity, especially in developing areas. U.S. export sales to Mexico, for example, increased 18 percent in August. Most U.S. producers, however, are targeting China, where exports were up 21 percent in the first half of 2014 compared with a year ago and prices are high. Producers entering the market now can get a jump on building brand loyalty and creating long-term sales opportunities. As U.S. retailers (such as Walmart and Costco) and European counterparts (Tesco, ALDI and Carrefour among them) enter China, they offer a natural path to market for their partner dairies, Shilk says. • Milk isn’t a cultural norm: Nearly all Chinese have some level of lactose intolerance or lactase deficiency, making lactose-free products a must — especially for the kids’ market. • Consumption tends toward single serve: Most milk in China is consumed in single-serve portion packs, Shilk says. Consumers finish packs in one sitting, so storage isn’t necessary. • UHT milk is 76 percent of the market: Refrigeration remains relatively uncommon in the country; shelf-safe UHT-processed milk is the norm. Seventy percent of chilled milk is home-delivered or sold in specialty shops. • China is the world’s largest flavored milk market: Chinese consumers are on track to consume 4.13 million liters in 2014, according to a Tetra Pak report commissioned from Compass Products and Packages. Flavored milk is considered an area of competitive advantage for the U.S. (the top flavored milk consumer) over New Zealand (the top dairy exporter) to China, the report says. Tags: Chinese, Dairy, demand, exports, Food Safety, Products, Spurs, U.S.
A Chilean consultancy has provided a variety-by-variety glimpse of cherry damages in the wake of weekend rains. Regarding oranges, South Africa has achieved a record crop this year, reaching 15.2 million 15kg cartons. The market conditions have been very difficult, firstly in the EU but also the US had a large crop. Increased plantings will help offset some of the impacts of rain on papaya volumes in Colima. A large apple crop in Washington means that the state’s growers will look to export a big portion of their crop this season. But a labour dispute between port operators and longshoreman has slowed the handling of containers through the ports, and could potentially lead to supply gaps for countries in Central America, South America and Asia, where Washington fruit is sent this time of year. “The situation is a huge mess,” said Randy Steensma of Honey Bear Tree Fruit. “We’ve got containers full of apples that have been sitting at the port for a week because they haven’t been loaded yet. If things are running normally, the vessel is loaded and gone in 72 hours.” Refrigerated containers and the high quality nature of fruit destined for export means that apples in limbo at the port likely won’t spoil, but the delay in getting fruit out quickly could lead to supply gaps in some markets abroad. “Buyers book on a weekly basis, so they will miss a week or two,” said Steensma. “We ship to Colombia, Honduras and Panama, so there will be gaps there, and also in some Asian markets, like Hong Kong, India and Jakarta, which is a big destination for us right now.” Shippers are hoping for a quick resolution to the labour dispute, which has intensified as the Pacific Maritime Association and the International Longshore and Warehouse Union have tried to agree on a new contract. The spillover from those negotiations has resulted in delays at the port. Though a resolution is urgently sought because of the broad commerce ramifications, Washington’s apple growers, who are sitting on a large crop, have been counting more on exports this year than in previous years. “In a normal year, about a third of the state’s apple crop goes overseas,” explained Rebecca Lyons, international marketing director for the Washington Apple Commission. “However, this year, with the large crop we have and with the large apple crops in other states, we’re thinking upwards of 50 percent of our crop will have to go to export.” Up to now, Washington was on course to have a strong export season, with the state’s apple exports up 50 percent over the previous year. The state’s growers also gained direct access to China for their Red and Golden Delicious varieties, but the port problems haven’t allowed growers to fully take advantage of that. ANAHEIM, CA — An early-October freeze in fruit-growing regions in Chile is not expected to have a significant impact on export volume, according to officials at the Chilean Fresh Fruit Association and the Chilean Fruit Exporters Association, known commonly by the acronym ASOEX. Meeting with The Produce News during the Produce Marketing Association’s Fresh Summit Convention & Exposition, here, Ronald Bown, chairman of ASOEX, said he expects a full recovery after last year’s challenging season, when a freeze severely limited export volume and strikes at Chilean ports further exacerbated difficulties in the fruit trade. Ronald Bown, chairman of ASOEX, with U.S. Department of Agriculture Undersecretary Edward Avalos, at the Chilean Fresh Fruit Association booth. The freeze last year was the biggest in 50 years, according to Bown, and it was the main factor in the 11.4 percent decrease in fruit exports, affecting mostly grapes, kiwifruit, stone fruit and cherries. Bown believes Chilean growers can make up for last year by virtue of the planned 5-15 percent increase in production. ASOEX is ramping up its efforts to reach additional markets, especially in the Asia-Pacific region, according to Bown. It also wants to ship more product to Russia and other European markets. 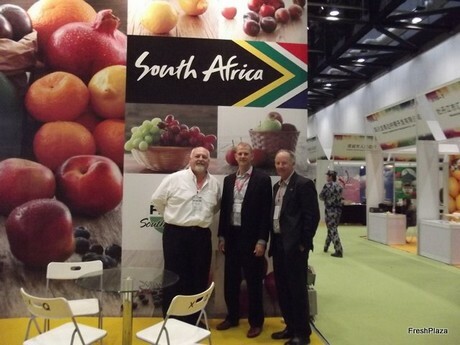 But he said the North American market remains a key destination for fruit exports. For its part, ASOEX does a good deal of outreach to maintain its preferred status among retailers in North America. Prior to the wide acceptance of fruit from Chile, Bown recalled that there was pushback when shipments began to increase. One area of focus for Chilean fruit exports this season is kiwifruit, according to Carlos Cruzat, president of the Comité del Kiwi, which promotes Chilean kiwifruit. His main quest is to offer preconditioned fruit that is sweet, flavorful and ready to eat. He cited a decline in consumption of green kiwifruit, as many countries have switched to gold-flesh fruit to meet the rising demand, especially in the Asian markets. He said that it is important to please consumers in order to increase the category.